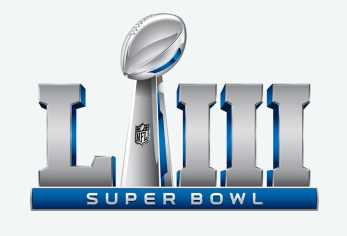 Super Bowl LIII will finally take place this Sunday, February 3, in Atlanta at Mercedes-Benz stadium. It will include the New England Patriots (again) vs. the Los Angeles Rams. Since the NFL Conference Championship games that were played almost two weeks ago now there have been many Super Bowl ads and teasers released. An ad during this year’s Super Bowl costs between $5 million and $5.3 million. The social buzz around these Super Bowl ads has had a bit of a slow start this year. A social media analytics firm, Talkwalker, reports that no advertiser has yet reached 5,000 social mentions after releasing their Super Bowl spot, but Pepsi’s halftime show has 20,400 mentions and Bud Light’s promise to give Los Angeles free beer if the Rams win has attracted 17,900 mentions. This year’s Super Bowl has generated 3.8 million mentions so far, down from the 8 million mentions generated by 2018’s big game during the same time period. But perhaps it will heat up once the country starts to as well. There does appear to be a growing number of promotions that the brands are adding to their campaigns around the Super Bowl. 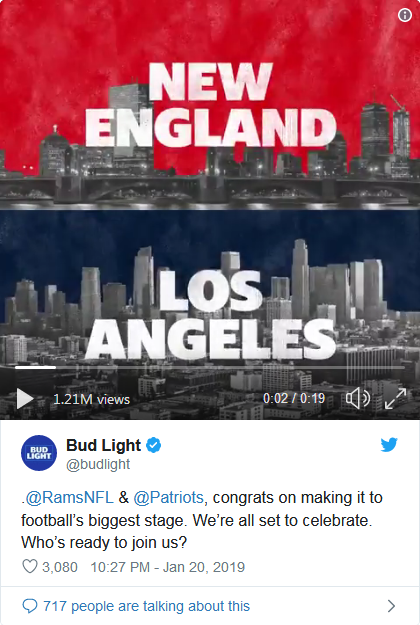 As with Bud Light’s free beer promise, it’s not just to the LA Rams, but to either team that wins. Last year they made the same offer to Philadelphia when the Eagles won. Bud Light handed out 38,000 cans of free beer to customers at bars along the Eagles’ victory parade route according to the Philly Voice. Those who weren’t at the parade received a $7 rebate towards a six-pack of beer. The details about how the beer will be distributed this year have not yet been released. Anheuser-Busch InBev is this year’s biggest advertiser running a total of eight ads. Last week’s post I included their Budweiser Clydesdales ad which also features the dalmatian and Bob Dylan’s Blowin in the Wind. The company also released this full 30-second ad for their Bon & Viv Spiked Seltzer that will also run in this year’s Super Bowl. 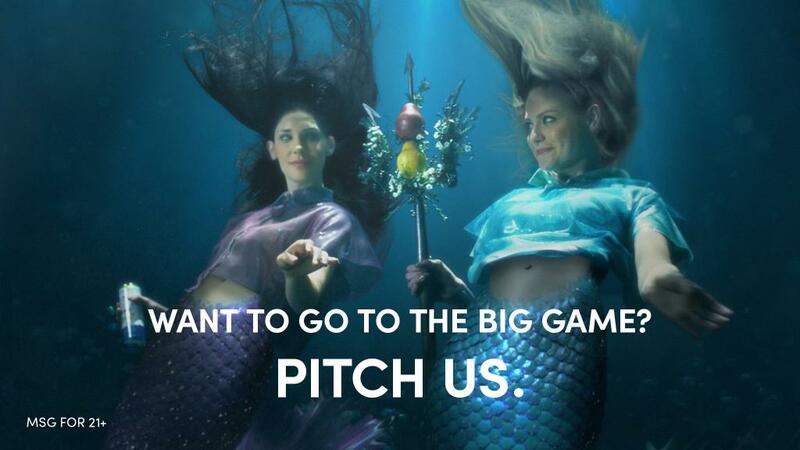 In features the two mermaids, Bon & Viv, in their oceanic environment as the makers of the beverage. They are pitching it’s benefits to potential investors, a bunch of real sharks, giving a new meaning to “shark tank”. Dan Laustsen, the Oscar-nominated cinematographer for “The Shape of Water,” was hired to film this ad which is done beautifully. In addition to the Super Bowl ad, Bon & Viv are running a contest with a grand prize of a VIP Super Bowl weekend, with game tickets, for two. To enter, fans 21 and older had up till January 28 post their “pitch” on why they should win the VIP weekend on Facebook, Instagram or Twitter using the hashtags #BONandVIV and #Contest. 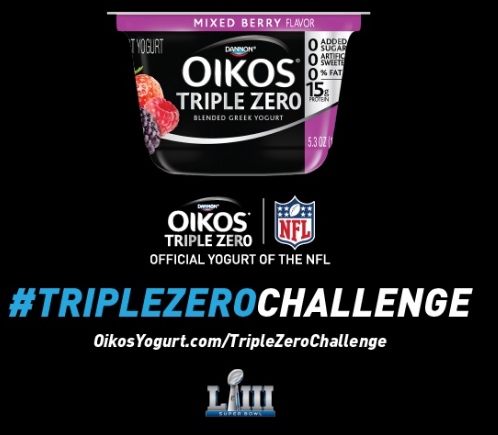 Oikos Triple Zero if the Official Yogurt of the NFL and has announced a Yogurt Giveaway tied into Super Bowl Yards Performance. The brand will give away cups of Oikos Triple Zero if the Patriots and the Ram rack up at least 1,000 combined yards. The Brand said “Super Bowl LIII will feature two of this year’s most productive offenses, putting the 1,000-yard mark, though somewhat rare, well within reach”. Last year’s Super Bowl marked the first time in NFL history that the teams logged over 1,000 yards, and also featured the all-time single-game record for total offensive yards (1,151). During the 2018 regular season, teams combined for 1,000 yards or more in three of the 256 games. If the teams meet the brand’s #TripleZeroChallenge, fans can visit the promotion site between Feb. 25 and March 4 and download a printable coupon good for a 5.3-ounce cup of the yogurt, redeemable at participating retailers on March 4. Pringles unveiled its actual 30-second ad after releasing three teaser videos last week. 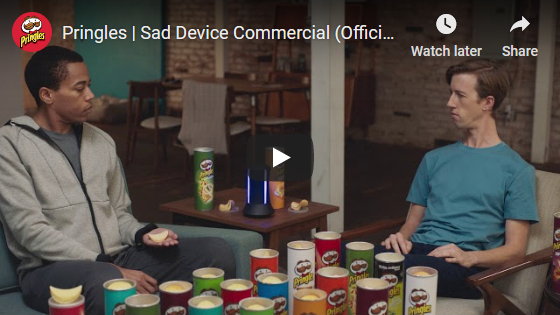 It features a smart device that complains about its inability to stack Pringles or taste any of the 318,000 possible flavor-stacking combinations. In conjunction with the ad, fans from the teams’ home cities, Los Angeles and Boston, will be able to tweet @Pringles on Jan. 31 and Feb. 1 for a chance to win flavor stacks themed to their cities, delivered by Fooji. These sponsors have all come up with some creative ways to make their Super Bowl investment pay off. I’ll post once more next week to summarize how the actual game as well as how the ads scored. We’ll also get to see how well the Pepsi Half Time show was received. According to an article that I just read it appears that the NFL has canceled Maroon 5’s pre-show press conference. Seems they want to minimize any further controversies as much as possible. That can’t be a good sign! Let’s just hope it’s a good football game. Enjoy!